part of a digital camera? The QFN16 marked BPR is, indeed, an IGBT controller and flash charger. TPS65560. Look very power circuit like to me.. The top of the drawing includes a part marked 8G134; and the connections are consistent with the datasheet for a GT8^134 IGBT I found online. One of the application list on the data sheet is flash strobe; which in conjunction with the thick lead leading away from that part of the circuit leads me to think this is the flash power pulse generator for a digital camera. And that would also explain the big inductor and capacitors. Looks very Canon to me too, having been inside several Canon cameras. They have used that exact battery holder a lot in lower-end models since the early 2000s. With these, the backup battery is buried deep inside the camera and not expected to be replaced within the camera’s lifetime, but with more expensive models it is usually user-replaceable. 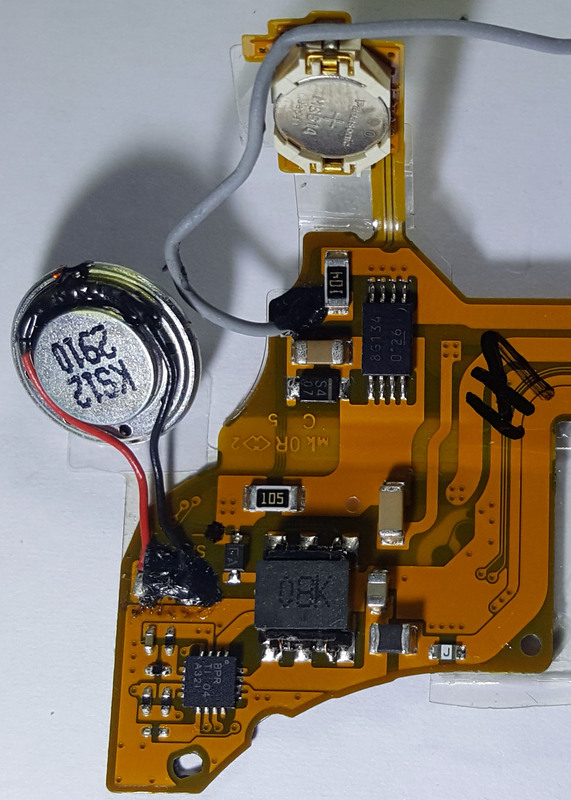 It has to be a part of a digital camera – speaker, RTC battery and flash circuit on flex PCB. Probably some bigger Canon? I wonder if that’s an inductive coupler, not a speaker. I’m going to guess it’s the circuit board from a disposable camera – simply to differentiate myself from the Canon explanation. It seems too good a board for a disposable and I’m not sure why there would be a need for a speaker, but that’s how I’m going to roll. Interesting board and a lot of fun to try and figure out. It looks old. Maybe a film camera that contained electronics? I disassembled one some time ago but I don’t remember the brand and model. It had a ton of flex PCBs.